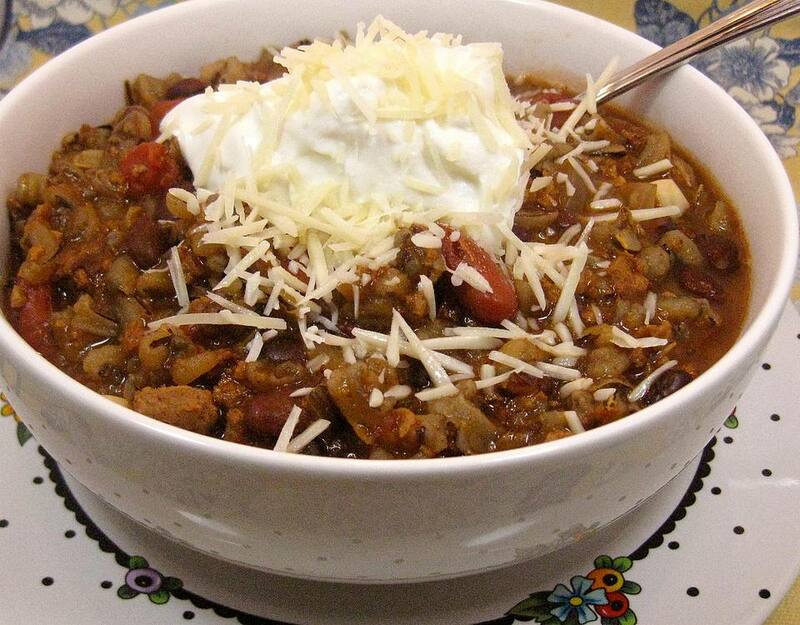 Feel free to substitute for just about any ingredient in this Classic Crockpot Chili recipe. Use your imagination! We like our chili mild, so if your ideal chili burns your tongue, add red pepper flakes, jalapeno and habanero chilies, and of course, more chili powder. And make sure you take a look at all of our chili recipes for even more ideas. Real chili from Texas or Mexico does not contain any beans and uses pieces of round steak or chuck instead of ground beef. But if you're looking for a classic American chili recipe, this one is hard to beat. It's a mild recipe, so season it according to your tastes. All you need with this simple recipe is some sour cream, sliced avocados or guacamole, shredded cheese, a green salad, and some cold iced tea or beer. Sauté the ground beef in heavy skillet with the onions until the meat is brown, stirring to break up the meat as it cooks. Drain well. Combine the cooked beef and onions, garlic, diced tomatoes, tomato sauce, chili powder, ground cumin, dried oregano, salt, pepper, cayenne pepper, and the drained and rinsed kidney beans in a ​4-quart slow cooker and stir. Cover the crockpot and cook on low heat for 6 to 8 hours or until the vegetables are tender. Turn the heat to high. Mix the cornstarch and water in a small bowl until smooth and add to the chili, stirring well. Uncover the slow cooker and cook for about 15 minutes, until the chili slightly thickened. Serve the chili with lots of accompaniments, including sour cream, chopped green onions, guacamole, sliced jalapenos, and shredded cheese.